Big Decisions and Beach Front Mansions. Think for a moment that our lives are like a walk on the beach. When we are born, our walk begins. The warm sun is rising over the horizon, glistening in the ocean’s waves. We look ahead and can’t see the end of the beach, the days ahead seem innumerable and full of potential. But time quickly passes, and all too soon we see the sun getting closer to the western horizon as we grow older and nearer to the end of our walk. We all walk this proverbial beach and what we do between sunrise and sunset is what counts. So I ask you this. 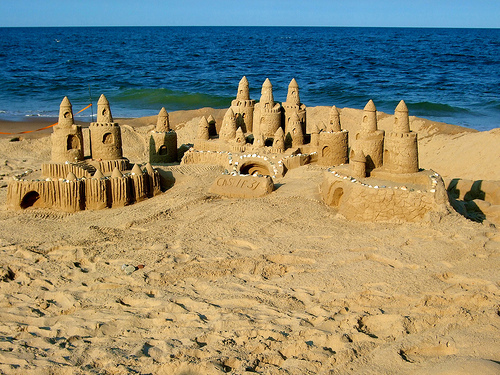 Will you build a house on the sand or will you draw a line in it? There are some who will go through life looking at only what they can accumulate here. Their goal is to amass wealth, power, and notoriety. They build a great mansion filled with everything one could wish for. But, while this home looks great to the eye with it’s intricate detail and moldings, it’s beautiful windows and oversize doors, it has a major flaw. There’s no foundation. All that it is, it’s construction, wealth, and beauty are subject to the weather. One storm could wipe it out. Everything would be lost. Then there are others who not only live with purpose, they live with divine purpose. They are no less passionate or less motivated. In fact, they are stronger and more determined than most! Each day they choose to deny their flesh and follow Christ. They invest in things that may not show a return here on earth but will be rewarded handsomely in heaven. But that’s not even why they do it. They do it because they love Jesus. They come to the place in their life where nothing else matters – they draw a line in the sand, a figurative challenge to themselves, and refuse to look back. They move forward in Christ. Their past failure? Doesn’t matter. Their past hurts? Forgiven. Their past addictions? Defeated and buried dead in the sand, never to control them again. They are determined to win. They will fight each day to defeat the enemy – the devil that fights against us all. Will they ever fail? Probably. But they will get back up, wipe the sand from their clothes, and keep moving forward. They will not stay down. It’s a choice we all make…. Will we focus on what we can build during our short walk across the beach or will we look ahead? Will we get distracted with day-to-day routines, as simple and innocent as they may be, or will we remember that how we invest here impacts our eternity? That’s a long time. Let’s challenge each other to look ahead. The gain here is nothing in comparison to what’s ahead. Previous PostThe Uncomfortable Truth About Eternity.Next PostCommitment: Do You Love God Or Just Really Like Him A Lot?